To prepare for paperless animation with Harmony, you will need to complete the following tasks. To sketch the animation directly in Harmony, you will mostly frequently need the Camera or Drawing view, the Xsheet or Timeline view, and the Tool Properties and Colour views. While drawing and animating paperless animation, you can use the Workspace Manager to save a frequently used layout and name it Paperless Animation, for example. For more information on setting up your workspace, refer to Chapter 2: Interface in the Fundmentals Guide. If the scene resolution was not already set by the digital layout artist or by a Toon Boom Storyboard Pro import, it is the next step to be accomplished. The layout artist, scene planner or animator will often take care of this task prior to the animation when working with paperless and cut-out animation. From the top menu, select Scene > Scene Settings. The Scene Settings dialog box opens. In the Resolution tab, Choose a resolution from the list or enter a new one. NOTE: It is important to set the resolution before you begin to set positioning and camera moves, as it may affect the ratio and composition. Once you have set the resolution and frame rate, you must set the scene length by adding the right number of frames to the scene. You can set the scene length from the top menu. If you do not yet know the number of frames that will be needed, simply add some frames so you can draw different poses. However, if you only need to draw a background and one pose, you do not need to add more frames. You don't need to do this step if you are importing your animatic in the QuickTime movie file format. The QuickTime import feature takes care of the scene length at the same time as the movie import. From the top menu, select Scene > Scene Length. Type the scene duration in the Number of Frames field. To animate a scene, you need to import your layout, storyboard or animatic, depending on which technique you are using. The most popular method is the animatic. 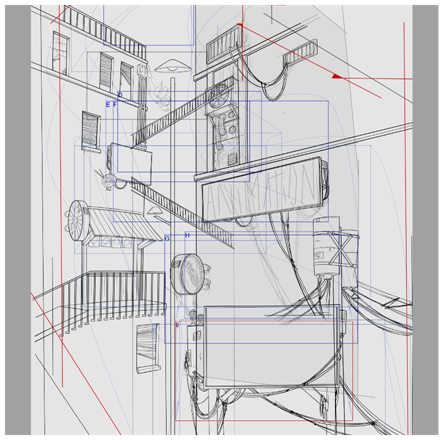 If you created a digital layout prior to the scene animation, you will animate directly in that scene. In this case, there is no need to import references since they are already there. If you have an animatic available, you can import it. 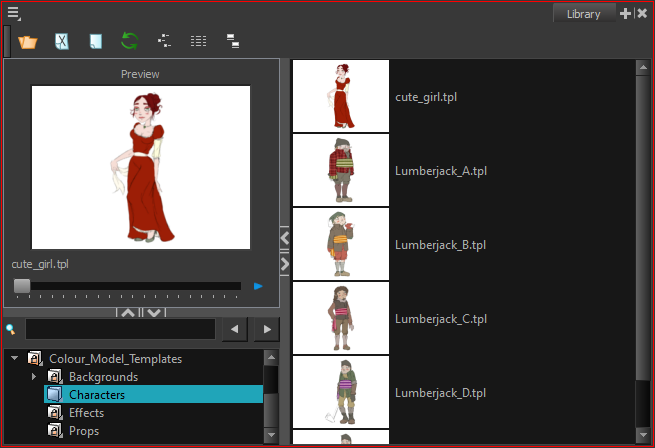 The animatic will give you the right timing to expose your animation poses. There are three ways to import an animatic in a scene. Toon Boom lets you import QuickTime movie files in the scene, cut them as image sequences and import the sound as an independent soundtrack. The Select QuickTime Movie window opens. The Import Movie window displays the conversion progress. When the conversion is complete, the Import Images dialog box opens—see the Import chapter in the Compositing and Effects guide to learn more. You can also import an animatic composed of a sequence of bitmap images that were created in a third-party software by using the Import Images feature. Use the same technique to import layouts and poses that were created on paper and scanned in third-party software. From the top menu, select Import > Images. The Import Images dialog box opens—see the Import chapter in the Compositing and Effects guide to learn more. If the animatic was created with Toon Boom Storyboard Pro, you need to create an Export to Toon Boom function from that software. This will create your scenes and import your layout and posing and camera moves. This must be done at the beginning of the production. When you work in Harmony, use the same technique as you would in any QuickTime animatic. If your project was created using Toon Boom Storyboard Pro, the animatic and camera moves are already set in your scene and you can go ahead and import the background elements. Once the layout or animatic is set, you can import the background elements. There are two types of background elements you can import: bitmap and vector-based. You can import external bitmap background elements to your scene using the Import Images dialog box. Be sure to deselect the Convert to Toon Boom Vector Drawing option to retain your elements as bitmaps and preserve your colours. To import a bitmap background, follow the procedure to import an image sequence animatic—see Importing the Animatic. For in-depth information on importing bitmap images, refer to Chapter 7: How to Import Bitmap Images in the Getting Started Guide. Before beginning to draw in the Camera or Drawing view, you must add a drawing element to the Xsheet or Timeline view. You will also need to select the appropriate cell in your drawing element. In the Timeline view, click the Add Drawing Layer button or press Ctrl + R (Windows/Linux) or ⌘ + R (Mac OS X). In the Name field, name your new layer. ‣ Click Add to add a first layer and keep the window open to add more layers. ‣ Click Add and Close to add a new layer and close the window. 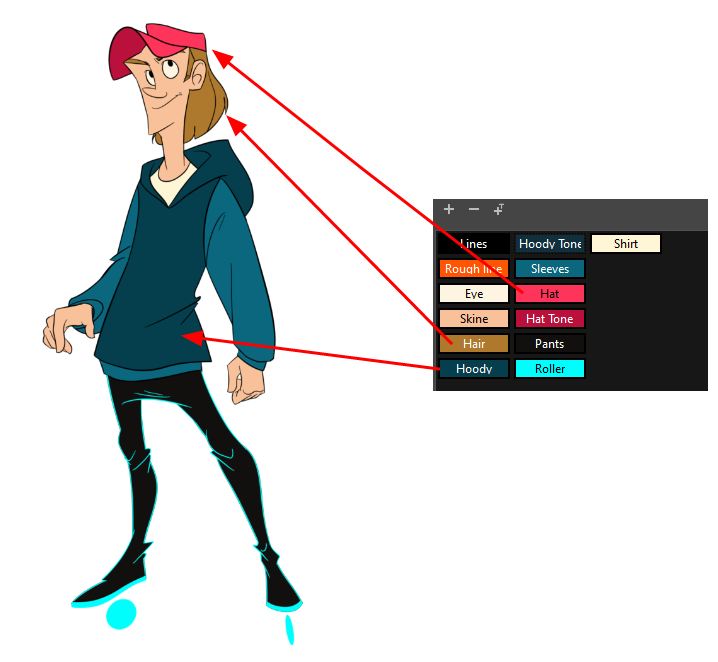 In order to animate your characters and props, you must load the colour models and their corresponding palettes—see Working with Palettes. Harmony makes good use of palettes. Each character can have his or her own colour palette with its own set of colours that can be reused in all the scenes. 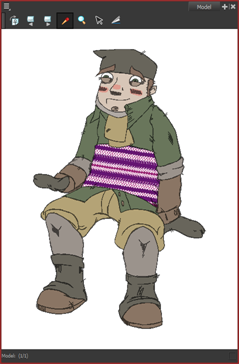 Each zone (for example, the shirt, eyes, shoes, and hair) can have its own colour swatch stored in the colour palette. Once the zone is painted with its corresponding colour, the zone and the colour are linked throughout the entire scene. There is no need to repaint each zone individually. If you modify the colour after the painting process, all the corresponding zones in all drawings and all layers are changed simultaneously. Prior to the paperless animation process, the colour stylist creates the palettes and models and stores them in templates or colour model scenes—see Colour Styling. Once the model templates are created, you are ready to import them into the scene. From the Library, import the appropriate templates to make the models and their palettes available in the scene. • Load the drawing models to the Model view. NOTE: There is no need to obtain the right to modify the Library in order to import a template. In the Template Library, select the colour model storage folder. Select the colour models you need and drag them to the Camera view. ‣ To create new layers and nodes, drop the selection on the left side of the Timeline view. ‣ To insert the information into pre-existing layers, drop the selection on the right side of the Timeline view. In order for the template to combine with existing layers, the structure needs to be consistent. If you cannot merge the layers together, create new layers on the left side of the Timeline view. When you import a template into a scene, there is no link between the Library and the scene. Instead, a copy of all elements is created, such as drawings, effects, and trajectories. You can modify anything copied in your scene. By importing the model templates in the scene, you have created a new drawing element. This also saves the master palettes in your scene. These palettes are local to the scene. The first step is to load your model in the Model view. You will then have to load the palette in your animation column. In the Timeline or Xsheet view, select the model's cell. ‣ From the Model view menu, select Use Current Drawing as Model. ‣ Right-click on the Model view and select Use Current Drawing as Model. The model appears in the Model view. 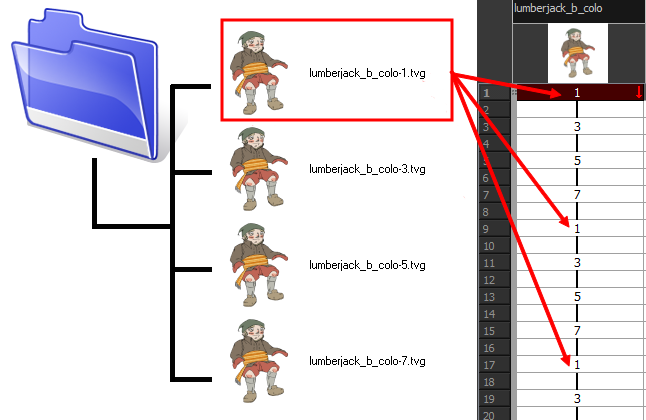 Once your model is loaded, you can import palettes in the animation column/layer. If you are animating a character or prop, it is always a good idea to use its proper palette for drawing, especially if you need to use different colours to clean the drawing outlines. This will save the colourist from having to load the palette and repaint with the correct colours. In the Timeline or Xsheet view, select the cell in the drawing element that you plan to animate. ‣ From the Colour view menu, select Palettes > Link or Import. ‣ Click the Link Palette button. Select a palette (.plt) and click Open. The Palette Browser windowdialog box opens. Enter a name for the palette and click OK.
Once your drawing elements have been created and your palettes are loaded, you are ready to create drawings for your animation. But before creating the drawings, you should familiarize yourself with the following operations. There are two different ways to create drawings. You can create drawings automatically by letting Harmony do it for you or by typing names (Typing mode) in the Xsheet cells. From the Timeline or Xsheet view, select the appropriate cell and start drawing in the Camera or Drawing view. Harmony creates the drawing and names it using the next available number. If there is no existing drawing, then it will be named "1", then "2"  and so on—see the Preferences guide to learn more about the Use Current Frame As Drawing Name option. To insert a drawing name in a column cell, double-click on the cell and type the name using alphanumeric values: 0-9, a-z, underscore (_) and dash (-). By default, if you press the Enter/Return key, the cursor will move on to the next cell. If you press the Esc key, it will quit the typing mode and return to normal mode—see Typing Exposure to learn more about the Typing mode. 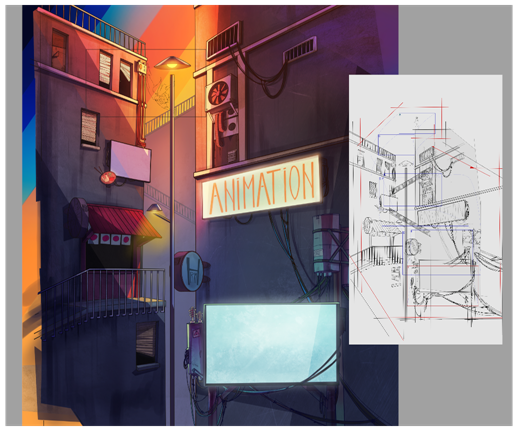 When you add a drawing element to your scene, a folder is automatically added to the scene directory. This folder is named the same as the drawing element. Its purpose is to store all the drawings related to this drawing element. For example, when working with cut-out animation, a character can have many hands available. All of these hand drawings will be contained in this folder even if they are not exposed in the Timeline or Xsheet view. In other words, there is always a drawing container associated with a drawing element (layer, column). All the drawings that were scanned in or created directly in Harmony will be saved in this directory. This means that when a value or drawing name is entered in the column, the Harmony will search the directory for the corresponding drawing to display. If it is unable to find it, a new drawing will be created. The column cells are not storage places, but simply links to the corresponding directory. If you remove a drawing from the column exposure, it will not be deleted; it is simply not displayed. You can always access it again. When you create a drawing cycle, all repeated drawings are linked to the same original files. So when you modify, repaint or correct drawing 1, the entire cycle will be updated; every time drawing 1 appears, it is accessed from a single file. When you want to rename a drawing, use the Rename Drawing command. Do not double-click on the frame and write a new name, as this will create a new drawing and hide your actual drawing. Note that your drawing will not be deleted; it is still contained inside the element folder. Simply re-enter the name and it will reappear. NOTE: To learn how to rename a sequence of cells by prefix or by frame position, see Renaming a Drawing.